Just do it. Nike’s slogan from years past rang true with people because of the simplicity of the message. If you know what to do, you should do it. James says the same thing. Read James 2:14-17. If we say we have faith in God, that should mean something in our life. Our life should reflect that faith to others so that it is more than just words that we say. If we truly have faith in God, our actions will be impacted as well. We will be livibg out what we know and believe. If we don’t live it out, how can we say we believe it? 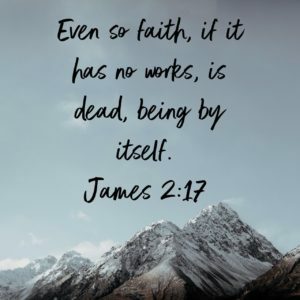 James lists a specific example in these verses, but we could all think of other examples from our own lives where our actions haven’t always lined up with what we say we believe. Are we sending a mixed message today? If people were given the choice to believe either our words or our deeds, but not both, would there be a difference in their options? If we say we believe God and have faith in Him, but don’t do what He says, then He has never truly impacted our lives and we really can’t say we believe in Him. Is your faith living or dead today?